Routine dental evaluations (dental exam) play a key role in preventive health care. 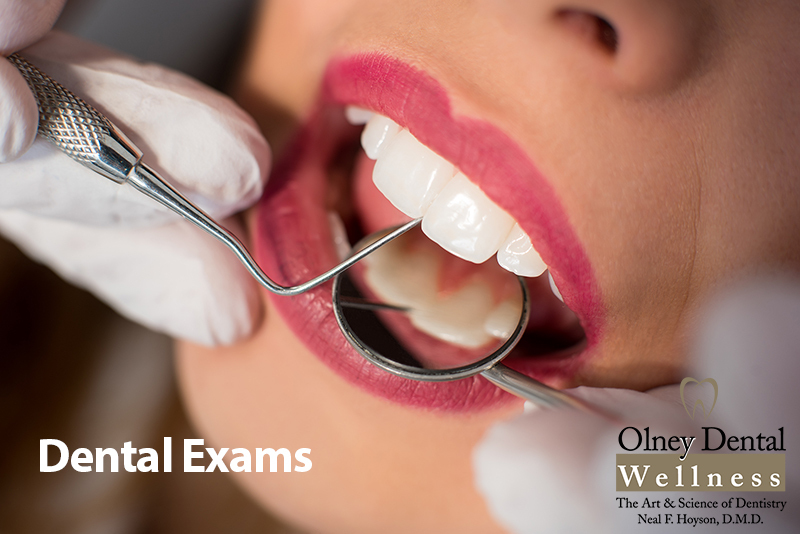 Exams allow you to discuss any concerns you may have about your teeth with your dentist. It also allows your dentist a chance to provide tips including your risk of tooth decay, gum disease, and any other oral health problems. Finding dental issues and or oral issues early when they’re most treatable is important to your overall health. Dr. Hoyson will recommend the best time to return for a follow-up visit. If you’re at a higher risk of tooth decay or gum disease or have other oral health problems, he might recommend more frequent checkups and dental exams. Medical and Dental History Review: A patient’s current medical and dental history will be reviewed including all medications and any pertinent medical conditions that may affect the patient’s oral health. Blood Pressure Screening: Utilized to detect undiagnosed or uncontrolled hypertension. Oral Cancer Screening: A comprehensive evaluation of the soft tissue structures which includes the tongue, throat, gums, lips, floor of the mouth, neck and face for any signs of early oral cancer. Digital X-rays (Radiographs): Digital imaging utilizes a sensor instead of conventional film-based imaging. Digital x-rays offer the advantage of an 80% reduction in radiation exposure to the patient. These images are instantaneous and are utilized to detect tooth decay, bone loss, cysts and tumors of the upper and lower jawbone. Evaluation of Existing Teeth and Restoration: Each tooth will be individually evaluated for decay, fractures, and mobility. TMJ (Temporomandibular Joint) Evaluation: Evaluation of the TMJ includes checking for clicking, popping, pain when opening or closing, as well as headaches or facial pain. Occlusal (Bite) Evaluation: Utilized to determine any irregularities in the patient’s bite which may contribute to facial pain, bone loss, and tooth mobility.